Our trip to Boston was both business and personal and pleasure came as a bonus. I hadn’t even planned on keeping my usual journal. But I did have a lot of time on my own and the whole trip was 5 days which isn’t a quick in and out. On day 1 I picked up a Hemingway Moleskin at the Coop in Harvard where I’m sure I broke some intellectual taboo. But the student checkout clerk did ask me if I had my “Harvard Card.” I nearly laughed out loud but thought I’d play it cool and go along with the possibly intentional mistaken identity. Needless to say I wrote quite a lot and found I had a lot to say about Bean Town. There were some gaps in representative photography so I did quite a bit of sketching, which I really love. I’m actually pleased with the outcome of the journal as a whole considering Boston isn’t one of those places I’d typically write 11,000 words on. 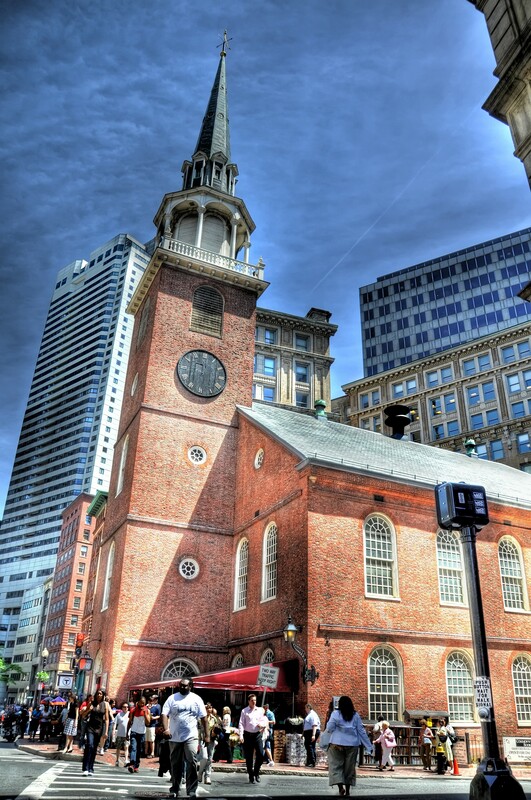 Below is one of the Colonial gems of Boston, The Old South Meeting House. A picture is worth a thousand words and I probably say at least as many about it in the journal. I simply admired your photographs!